Welcome to part three of this huge M11 EDH review (hence the title). If you missed parts one and two they are here (White) and here (Blue). The most interesting thing that has come out of Magic and reviewing sets is something that Pro Player Patrick Chapin wrote (Star City Games Premium article, sorry). Basically what he says is that reading review articles are boring. Most of the time they say the same thing, which is “Oh, this is what the card does, this is the type of decks it can fit into.” I do my best to try and avoid it, but I know I do that from time to time. It’s like reading movie reviews of the same movie: soon you’re going to get the same type of dialogue repeated over and over again if you read enough. There’s only so much ground you can cover with the same material as everyone else. Now, he suggests adding humor because it does liven up the same old thing. So I’ve decided to follow his wise advice. In the Worldwake and Rise of the Eldrazi review I had Billy Mays review a card in each while Vince pitched a card in RoE. Though my contacts in Hollywood (every MTG blogger has contacts in Hollywood), I was able to get comedian Lewis Black to review every single Black card in M11. Say hi, Lewis. Oh, is this because my last name is Black? I know. Wait, where are you going Mr. Black? (Door Slams). Sigh. I guess I’m going to try to do the comedy. Cards in italics are reprints. At the very end of all the reviews, you’ll get my Top 10 list of EDH cards for M11. You’re thinking multiplayer, I’m thinking multiplayer, so lets get that off the table. It triggers Sygg, River Cutthroat, but you only draw one card not one for each opponent. When you play this, I guess there really will be blood (Obvious movie pun). Urborg, Tomb of Yawgamoth. Anything else is just second place. People have been saying this is a combination of two cards: Dark Confidant and Phyrexian Arena. It’s an enchantment so Black has a harder time of getting rid of it than a creature, and it costs one more (which is why the Arena enters the discussion). Everyone knows its card advantage by giving you two cards, but the real question is should this be played over Arena? If you’re going to put this card in your deck, you’re going to build around it. Cards like Sensei’s Divining Top and Crystal Ball help manipulate the top cards of your library to help offset the life loss if you don’t get a land you can reveal. Plus, starting out at 40 life kinda help out if you do flip over something that hurts the life. If you throw it in there just because it’s good, you’ll end up hating it because you won’t be doing it right. A 9/9 flying trample Demon will deal with a good number of creatures in the sky. The alternate casting ability is one people are going to play around with to try and get it into play earlier. That means you pack your deck full of creatures to make sure you have three creatures early to sacrifice or you play Grave Pact. Hey, I like that Grave Pact idea, let’s go with that. I don’t think there’s anything I can add to convince you if you want to play this card or not. Third in the Titan cycle, this one adds some punch. The ability to create 2 2/2 tokens each time you attack with it (as well as when it enters the battlefield, perfect for reanimation) will win attrition wars. The deathtouch may seem a little over the top, but when you keep swinging with your Giant that keeps making zombies, it will wear down their line of defense. If someone does kill this giant, just sacrifice one of the Zombies to a Hell’s Caretaker to get it back to get two more tokens. Powerful? Yes. Really awesome art? Of course. Dave Matthews says hi. It was either that or an “Alas poor Yorick” joke. A utility card in most cases, this wrecks opponent’s reanimation plan, but also yours if you want to steal from them. Black has plenty of ways to remove cards in graveyards but this is a nice blanket to have. I think it all depends on your play group if you have to feel you want to put it in your starting 99. Her tutoring ability is great in this format, but it’s going to be her Ultimate that’s the most fun. Of course that’s the same for all the planeswalkers so that’s not really saying a whole lot. Better than Megrim. Any situation where you would have Megrim, you want this instead (or with). You’re thinking multiplayer, I’m thinking multiplayer, so lets get that off the table (Pete and Repeat are on a boat; Pete fell off, who’s left). A fun card for sure, but it will get real annoying real fast. If you mix it with Grave Pact (what Black deck isn’t made better with Grave Pact?) and Butcher of Malakar, it will clean the board pretty quickly. Need artifact, blah blah, indestructible, blah blah, fast beats. I’m not impressed for EDH. Creatures that are just there that don’t do anything really aren’t amazing in EDH. That’ll be a post for later. Ah, the way people thought Regeneration used to work. This cute can be used in so many ways where people want to sacrifice or discard. It will take some time before people start realizing how powerful this 1/1 can be and you’ll end up groaning when you see it from that guy who’s made that combo with it. I suggest Copy Enchantment and Carnival of Souls. When have you heard of someone suggest Carnival of Souls? Still can only use one in EDH. Worst rat ever. Apparently, you can shove as many into an EDH deck as you want. Go for it. Works well with a creature that would be great to have it keep coming back into play. Huh, wonder where I can find that. Like I said in the Blue section, don’t sleep on Scry. Yeah, Black kinda got the shaft for EDH in this set. The best card is a knock-off of a really good invitational card and the best creature is the third best in the cycle. Don’t worry Black mages, there were some great Black cards in the past few sets so I don’t see this as a trend. 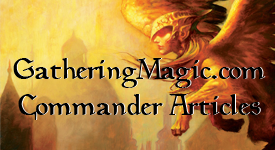 This entry was posted on Wednesday, July 14th, 2010 at 11:50 pm	and posted in EDH, M11, Magic: the Gathering, Really Big EDH Review. You can follow any responses to this entry through the RSS 2.0 feed. I’ve had a lot of luck with Reassembling Skeleton in my Oros Equipment deck. He’s always there when I need someone to carry a sword or jitte and is absolutely ridiculous with Skullclamp. Woah woah, what’s the past tense for? Also, Relentless Rats are still better than Muck Rats. At least it combos with Rite of Replication. People used to think Regeneration used to work like the Skeleton does. They thought that you could regenerate it after it hit the graveyard and bring it back anytime. Caused a lot of confusion back in the day. I appreciate your feed back. Here’s the funny thing about knowing my audience: half of them want deck lists, half of them want casual, half of them want more competitive, half of them want combos, etc. EDH is casting a wide net over Magic (which itself is a wide net). I was just trying to do something different rather then the same old review. I like the fact that you tend to read only mine (I appreciate that), but there are people who read everything they can about the subject. Black happened to be the weakest color in this set and breaking the color apart I tried to do something to entertain. On my other blog (mtgcolorpie.com), I end up doing different stuff over there all the time. I haven’t brought that to 99EDH very often because it does cater to a different crowd some of the time. Hopefully you’ll still find the rest of my analysis helpful to you.